We have an intimate conversation with CLIVE BARKER as he looks back at HELLRAISER, his seminal cinematic creation on the 30th anniversary of its release. Also features the film’s original CENOBITES talking about the roles that sent them to hell. Also features new soundtrack reissues from Lakeshore and Mondo. Plus: We travel through gloom-shrouded London in the grip of the Spanish Flu with the creative team behind VAMPYR; Maniac remake director FRANCK KHALFOUN talks to us bout his late coming AMITYVILLE: THE AWAKENING; inside the NIGHT MIND; THE KILLING OF A SACRED DEER; Bowen bids farewell to TOBE HOOPER; Black Museum exhibits POWER TO THE PUPPETS; Nathan Carson and Sam Ford’s THE WILLOWS; Crystal Lake Publishing’s WHERE NIGHTMARES COME FROM; the maniacal multimedia of DAVE CORREIA; the Homicidal Homemaker whips up WHITE CHOCOLATE CARAMEL PRETZEL FINGERS; Bear McCreary’s score for THE WALKING DEAD; an interview with the creators of THE EVIL WITHIN 2 survival horror game, two writers go head-to-head in VS, and lots more! 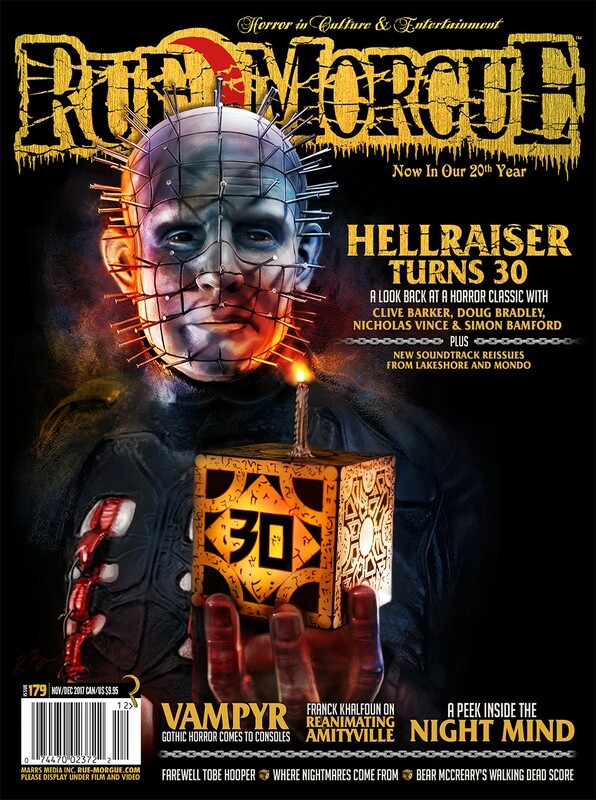 Save on shipping waiting time and costs with RUE MORGUE DIGITAL available NOW for iPhone, iPad, iPod Touch, Android, PC and Mac for only $4.99 an issue! Hi, When is the digital edition issue of 179 going to be available? Will issue 179 be available through the Ipad-app? I certainly hope so, since my desperation let me to buy the issue from your YUDU-shop, and what a horrible experience. Yes its cheaper, but trying to read it in the browser on my Ipad Mini was more than annoying. If at least YUDU had an app, that I could read it from, I would not had minded it, but first having to log in to their website(text nearly impossible to read on a small tablet), finding my library, and first then be able to “read” my magazine! My google-browser wouldnt even let me see the website in fullpage-mode, but kept the top URL and bookmark header locked to the screen! Please tell me this is not the future for the digital version of Rue Morgue!!! !